Surging forward unopposed, we’re blazing to your screens to continue listing the teams of brave men and women flying in this year’s AT. We’re going to talk about Pandemic Legion, Phoebe Freeport Republic, Polarbears., Psychotic Tendencies, Quebec United Legion and Rabble Alliance. 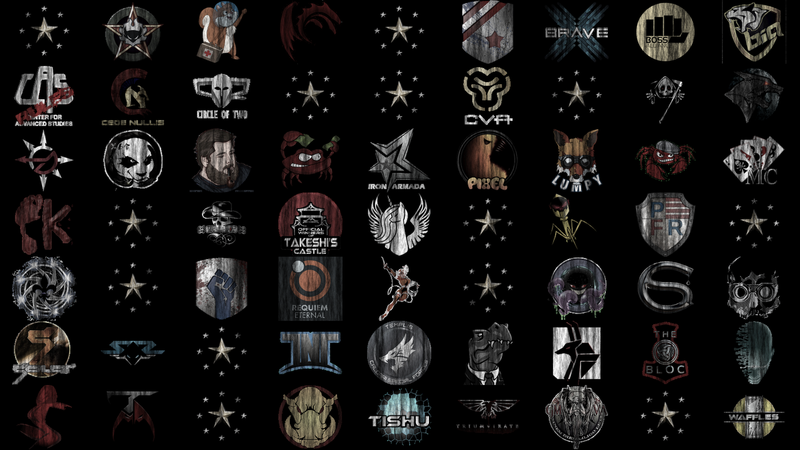 Pandemic Legion, known primarily for being home to one of the largest supercapital fleets in new Eden, with history of a strong and deeps FC roster also happens to be the winningest team in Alliance Tournament history with five victories under their belt. Only one other team has won more than one tournament, Band of Brothers, and it did so by dominating in ATs I through III. With the collapse of HYDRA RELOADED, PLs historic rival, they stand in front of a legion of young, strong, teams coming at them from every direction. ATIX: Ro16, losing to HYDRA RELOADED. ATXIII: Won, after HYDRA RELOADED and The Camel Empire were disqualified for collusion. Pandemic Legion famously never matched the execution and piloting skills of their bitter rivals HYDRA. Though naturally excellent to be at that level of the competition, PL have been more known for their deep theorycrafting, understanding and manipulation of the meta, as well as their spying. This, however, has historically backfired on some occasions when the tunnel vision skews too deep… or you bring all Amarr jammers against a team with no Amarr ships. Pandemic Legion are the team to beat this year. Some people are calling Tuskers stronger and that may well be true but based on pedigree and past results PL are still the kings of the tournament. Oh PFR. PFR had a surprisingly good run last year as an Alliance of predominantly young players with little tournament experience and have since closed their doors, just keeping the light on for the tournament team. Originally intent on opening freeports across sovereign null, PFR shut down operations a few months ago. Last year PFR showed a penchant for undermanned setups, mixing T3Ds and Interdictors with a heavy battleship core. It fared them well as they beat Clockwork Pineapple, Brave Collective and R.E.V.O.L.U.T.I.O.N, losing only the heavyweights Hard Knocks Citizens and Nulli Secunda. I really hope that PFRs closure hasn’t cost them their AT team, it will be sad to see a new spark in the tournament scene be snuffed out so soon. Polarbears. are a casual AU/EU PvP wormhole alliance and they are also my favourite team of ATXIV. Besides having a super cute name, they had a really fun match with Tri in the open practices and have really wacky setups from what i observed. Setups which beat much more established teams flying much more “standard” comps. GO POLAR BEARS! TISHU, lead on and off for the past few years by Lex Arson, are possibly best known for their less than tasteful sense of humour. In EVE, that’s pretty extreme. Most recently chilling with PL and doing some joint ops here and there, TISHU is one of those alliances who pop up for a few months, do a bunch of stuff, and then disappear again. Despite this being their fourth attempt, this French-speaking team have only won one game of the seven they’ve played. In ATXI they lost to Darkness of Despair and Angelli Mortis, and in ATXII to Pasta Syndicate and The Devil’s Warrior Alliance after beating Choke Point. Last year in ATXIII they lost to The Tuskers Co. and Project.Mayhem. Mad props to them for continuing to try though, maybe this year is their year! The Rabble Alliance Team Captain, Cyclo Hexanol, told me he’d be down for an interview and then never replied to any of my questions. I’m not sure if it was a troll or he unexpectedly had to leave the computer for a day. It’s Rabble’s first run at the AT and, until recently, they held sov in Querious. Best of luck chaps! Home to noted EVE personality Mangala Solaris, Red versus Blue are two corporations, Red Federation and Blue Republic. They are eternally at war with each other in HiSec while running cheap, newbro friendly, PvP ships and following gentle rules to attempt to keep things fun for everyone. This will be their fourth entry into the alliance tournament. ATIX: Lost to White Noise, beat Babylon5., lost to SOLAR. ATXII: Bye vs CODE. (who didn’t show up), beat Agony Empire, lost to Nulli Secunda and Shadow Cartel. RvB had two really strong runs in ATX and ATXII and they’re going to need all their strength in their first match against THE R0NIN. They will pose a serious challenge but not insurmountable for a team of RvBs calibre. Despite being around for nearly three years this is Requiem Eternals’s first foray into the Alliance Tournament. A multi-game community, RE takes a more relax approach to the game currently holding a single constellation of sov in Tenal. RE are one of two teams, along with End of Life, who have chosen a Scorpion as their flagship which to me presents a super interesting mental game in store for their opponents. Expecting a flagship Scorpion means that any team facing them NEED to be able to deal with ECM, but this may cause some teams to over-prepare for ECM, skewing their comp far too much towards it. At that point RE can just not bring any ECM and take an advantage by tricking their opponent though flagship choice, before the bans have even been chosen.